I do not supply more than 2 plants of any item. I no longer send orders to China. Packages can take up to 2 months to arrive, by which time many of the plants are dead. 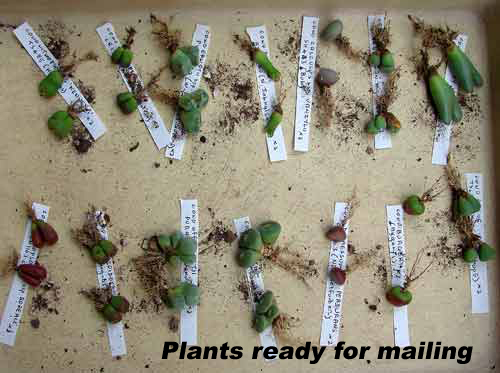 Dispatch Conophytum plants can be dispatched between August and March, except during periods of cold weather. Seeds can be mailed at any time..
Postage & Packing A flat rate charge of £4.00 for the United Kingdom or £4.50 for other European countries should be added to your order to cover the cost of postage and packing. Where regulations allow you to purchase from outside Europe, the postage charge is £6.00 per box. I use first class mail within the UK and standard air-mail (NO TRACKING) outside the UK. Payment This should accompany your order and can be in the form of cash, Postal Order or a Sterling cheque drawn on a UK bank. A cheque with the value left blank but endorsed with "not to exceed £x", where x is the maximum possible value of the order, will avoid substitution when plants are out of stock. Overseas customers may pay in UK Pounds in the form of a Bank Draft drawn on a UK bank, otherwise they can send cash as UK Pounds, American Dollars or Euros. I can not accept payment by credit card or bank transfer. All cheques should be made payable to T. Smale. On receipt Please check your plants and notify me immediately, quoting reference number, if there are any problems. Please list some substitutes, use a ‘not to exceed” cheque or ascertain availability by E-mail to terry@smale1.demon.co.uk I do not check my E-mail every day so please do not expect rapid replies from me.